Discussion in 'Henson Alternative' started by Buck-Beaver, Feb 8, 2006. So there is a special event at the upcoming U.S. Comedy Festival called "Jim Henson's Puppet Improv" in Aspen. It's an adult only live performance and features some of the best Muppet performers. Presumably no Muppets though, since it's a Henson Co. event and Disney doesn't appear to be involved. That's pretty cool news! It would be nice to see what they can come up with when they think outside of the established Muppet style of performing. Also interesting is to see that Yerrid and Massey will be there. 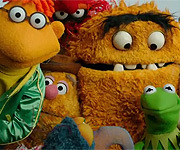 I guess this means they have been accepted into the Henson lineup of puppeteers, perhaps on a more permanent level now. I hope it's a true improv and no pre-planned sketches. One of the traits of a great Muppet performer is doing improvs with the puppets, and being humorous while doing it. You can be a great puppeteer, but if you don't have the gift for improv, you can't be a real Muppeteer. I hope the Puppeteers of America can work something out with the Henson's and videotape this event for other can see it in the future. This is the coolest, most original idea I've seen come out of either Muppet camp in years upon years! God, I've gotta see how I can get down there and view this firsthand! Someone had better release a DVD of this or something! We haven't seen an adult and "naughty" Jim Henson production since the old SNL Gorch skecthes of the mid 70's, so this is a landmark occassion! Also interesting is to see that Yerrid and Massey will be there. I guess this means they have been accepted into the Henson lineup of puppeteers. Drew and Victor have been working in the Henson lineup for years. Massey worked on Dinosaurs, Muppets Tonight, Muppets From Space, The Muppet Show Live, Its a Verry Merry Muppet Christmas Movie, The Muppets Wizard of Oz, and From the Balcony. 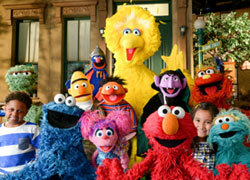 Yerrid has worked on Bear in the Big Blue House, Muppets From Space, Farscape, and From the Balcony. It be to cool if they could get Frank Oz to come in and Puppeteer. I'd like to second the defense of Victor and Drew. I don't think OverUnderAround meant any disrespect, but they are both very talented guys. It's a stellar lineup of puppetry talent. This sounds very cool, but it doesn't appear to be an original idea in terms of puppetry. Maybe a first for the Henson group, but a certain name comes to mind. Anyways, I hope they take it somewhere else and create a new 'market' for their puppets. btw this is my first post it's so nice to be able to talk to you all finally! The sketches will not be pre-planned, it is all truly improv. The puppeteers have been training with Groundlings performer Patrick Bristow for the past nine months to perfect their improv skills. Just like the Groundlings (the legendary Los Angeles improv company that launched the careers of Phil Hartman, Lisa Kudrow, Jon Lovitz and others) the sketches will be performed based on audience suggestions. Hey some one needs to go and tape it and post it on the Web! Any one Going or close by? Oh, Statler and Waldorf at movies.com. I forgot that's what their show was called. If anyone here is planning on attending this and would be interested in working on a story for the event, please contact me. Paul Rugg! Dude, Paul Rugg! Maybe I can attend this. I really would love to. I need some autographs of these good preformers. Maybe they'll talk about the "Muppet Amercain Idol" thing or whatever it's called. But I'll let ya'll know. where is this promo pic at? take some picture or video's if they let you and share the wealth of info! !